The end of an era. – My thoughts on a page. Parents hold their childrens hands awhile, but their hearts forever. Today began like any other. It had no special feel to it. We could never know that today was the end of an era and the beginning of something new. My older children are at work, or already on holiday which means there is only one twelve year old girl to get ready for school. As there are only five days left until her own holidays begin, she is enjoying the fun of final days, and looks forward to going to school. This morning as she got ready my husband and I were unaware that time was slipping by. If we had known we might have read the signs of her growing up better. We might have seen how long she spent brushing her hair, whilst checking out her appearance in the mirror. We might have noticed how much more interested she was in fashion, or the fact that last week she had insisted on buying a new pair of runners that were similar to the ones worn by her older sisters. If we had looked we would have seen that she got most of her own lunch ready, that she was up on time, and that she needed no prompting to remind her to brush her teeth or put on sun cream. She was becoming independent. All the signs were there that she was growing up, but we had missed them, or perhaps we had chosen to. At eight thirty my husband and daughter set off on the ten minute walk to school. I waved them off, as I have done many times before. These two are a very close pair, and are often seen together around the village. Twenty minutes later my husband arrived home. “She didn’t want to be seen with me”, he said, with a half smile. My heart sank as I heard him speak. I could hear in his voice, the sense of loss, and the reality of what her growing up meant. He had been here before with her older siblings, but then there was always a younger child to take their place. As he sat down beside me he said wistfully, as much to himself as to me, “Ah well I had her a long time I suppose”. His words, spoken so honestly, hit me hard. I really felt for him. This was a Dad who had carried his children in his arms so often that my mother had remarked frequently to him “For goodness sake that child has legs”. This was a Dad who always kissed his children goodnight, no matter how late it was, and who loved to lie on their beds and chat. This was a Dad who had played with them every evening after work regardless of how tired he was, a Dad who had brought home Friday sweets every Friday for nineteen years. This was a Dad who for the past twenty three years has had a small companion happy to walk along side him. A Dad who loved being a Dad. Tomorrow morning as Father and daughter set out together, it will appear to an outsider as if nothing has changed. 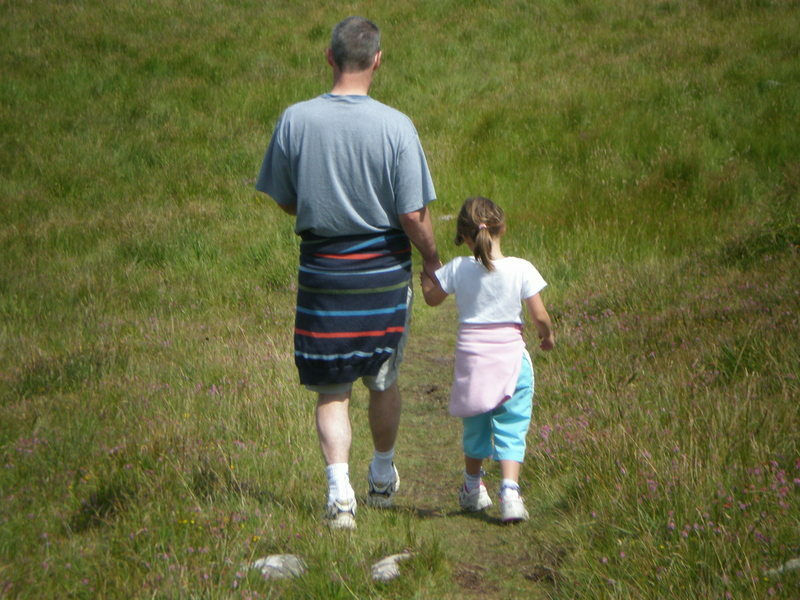 Yet as her Dad brings her closer to school she will gently push him away, and go on her way. Each step taking her further away. And I know as he watches her go he will feel both pride and pain in equal measure. It is indeed the end of an era. 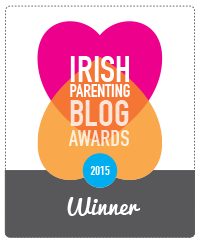 I was prompted to write this in response to a linky on a fellow Irish bloggers blog called “The Busy Mamas” The linky is “Tales of parenting moments gone by”. There are a lovely collection of very different experiences there to be read, so if you get the chance do check them out, or better still join in and write your own. Thanks Irene. Yes she is definitely getting independent, and yet still young enough for us to continue to enjoy a few more childhood years. Aww, Tric! Give him a hug from me! I will do. Thanks Emily. At least he can take some comfort that she’ll be back to him again when she’s spread her wings enough to find her way back home. Oh definitely. He is the softy in this house, and I have seen my eldest return to him time and time again. Thanks a million. Loved your post too in this linky. Agreed. When this happened I immediately thought of this link. It was lovely to capture it. He’ll be grand, she has him well wrapped up! Yes, we are coming to that as well. It has only been in the last week that the Tween has stopped me from helping do her hair each morning. And as much as I used to tease her about becoming more independent, it sort of hurts that she doesn’t need my help any longer. I thought of you today, as I remembered we are at the same stage in parenting. Lovely days, but with a hint of sadness. That’s true. Being the last child makes it that much more difficult too. what a lovely bittersweet post! And what an amazing husband you have! He sounds like he’s been a fabulous father to your children. They have been very blessed! Thanks for sharing your end of an era. Thank you. Both I and my gang have been so very lucky in their Dad. I couldn’t have wished for any better. Thanks Sadhbh. He is something else alright. My little ones (now big) are lucky, Some day they will know that. Breaks my heart. Been there before, and indeed, it did break my heart. 😦 Beautifully written, I might add. Thank you. It was sad, but you can’t hold them back and it is lovely to see her growing up as confident as she is. She is also mindful of her dads emotions, which is lovely to say. They have been pals for years. That will never change I hope. Fortunately Tric, they come back to those times themselves. Time and time again. They miss them. They miss the security and comfort. They might not realize it for awhile….but they will. And then there will be the grands. 😉 And it begins again in such a wonderful way! Agreed. They may want to be grown up, and feel grown up, but often we see they are still our little ones. As for the grands, a great friend had her first grandchild last week, OMG I can’t wait, although don’t tell my eldest. Secrets safe with me. But I get it. Thanks beth. I think there are many of us who never forget so many small moments. Hope the Aussies have arrived. Awe. Your poor hubby. I don’t look forward to this!. As you well know parenting is full of firsts and lasts. With this end of an era comes a whole new beginning too. I hope your two are enjoying turning your life upside down. Beautifully written! Seems like we think of the empty nest from the mother’s point of view. It’s nice to see it from daddy’s side. Thanks Deb. He’s a lovely dad. Pity they have to grow up! I think fathers and daughters can have the most amazing relationships. Neither will ever forget that great foundation and they’ll keep re-uniting as the years pass. I agree. I adored my dad, and it is lovely to see my children have such a lovely relationship with their dad. I got that about a month ago Tric. Started with the GAA. Feeling for Eamonn, really hard for a dad. I suppose it’s the circle of life. They come around again when they get to their late teens, the time they start looking for lifts. How sweet! Your daughter is blessed to have a loving father like your husband. Thanks Jackie. Yes I have been very lucky to have him, and now the kids are getting older they are beginning to appreciate him too. She is a very kind little one and was inquiring after if he was okay. There’s something in my eye. Thanks a million. Yes I really felt for him. But as all parents do, we just adjust and enjoy all we have. Love the different perspective on this. I hope our child will have as good a relationship with us as he grows up. Thanks Sheila. I am sure in time your little one will be just like this, as we have been here three times before. I love that you wrote this about your husband. It’s simply beautiful and a really great addition to our little stories which are all about moving on. Ah Helen it was a lovely linky. One of the nicest I’ve read. The other posts are beautiful. Thanks so much for the opportunity. I really enjoyed it, and by the look of it many others can empathise with this one. Thanks Elizabeth. I was trying to stay away from the moany “my little one is growing up” posts as I’ve done a few recently, but I couldn’t resist this one when I saw it happen. Enjoy your little ones, and even though this was the end of an era, we also have the beginning of a lovely new phase. I called over to see you. Well done on your studies. I’d love some day to do something in writing. Best wishes for your future writing. Oye. This one hurts, I suppose that day comes for all of us. I can’t imagine. I can remember being dragged by my parents to the drive-in movie while I was a teen. I was petrified that one of my school chums would spot me in the back seat! I would slump down and basically, just listen to the movie! Ahhh…the pangs of growing up that parents and kids share! Great post! Thanks for the smile! Oh you got me! And my hubby… as I just read a passage to him, we will be squeezing the life out of our ten year old tomorrow, the poor thing won’t know what’s going on! Glad you “enjoyed” it Naomi. Dads, I think, are often overlooked. As you know I really liked your contribution too. Like you I didn’t read the others until after, and then totally enjoyed them. Aw, you poor hubby!I remember going through that phase with my own dad and then realising how horrible I was to him years later.Poor daddies and mummies-we make them suffer!